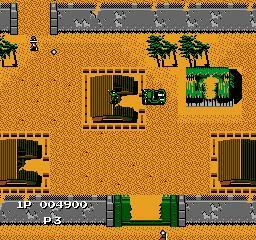 Jackal is a top-down, run 'n' gun game that was first released in the Arcades in 1986. Playing as a Green Beret, your mission is to rescue trapped POWs across six stages and destroy the enemy's main fortress. To do this, you control an attack jeep that features a machine gun (fires straight ahead), hand grenades (can be launched in any direction) and bazookas (can be powered-up by rescuing certain POWs). The controls work flawlessly and despite what you might expect your vehicle is incredibly nimble! A big plus is that unlike Gun.Smoke (1988, NES) you can fire in any direction, giving you complete freedom rather than having to play within the limitations imposed by the developers. The awesome level design stretches both horizontally and vertically, and there's a decent amount of variety, such as Stage 2's falling debris and grenade launching helicopters. Another highlight is Stage 5's bunkers that block your projectiles; it's a simple, but effective idea that forces you into firing diagonal shots to hit the target. However, the best part of the action is the endless satisfaction you get from trampling over enemies in your jeep! The option to rescue POWs encourages you to explore the playfield rather than rushing through, and I like how trying to survive with each one intact until they're picked up at the end of stage heliport (for points) becomes a mini-game in itself. The difficulty level throughout is spot-on and the game eases you into the action, while rewarding pattern recognition and repeated attempts in later stages. The ability for 1-2 players to battle simultaneously is great, and from a technical standpoint there's zero sprite flicker or slowdown. My only criticism is that the screen doesn't always scroll far enough, which can lead to blindside deaths when a bullet or enemy vehicle enters the playfield. Jackal is a top-tier NES title that plays and controls smoothly, while having an ideal difficulty progression. Couple that with the exquisite level design and you're left with a hugely entertaining game that's non-stop fun whether you're playing alone or with a friend. Random trivia: In Japan, the game was released on the Famicom Disk System, and featured different layouts and missing stages due to the smaller disk card size.